Magnus Carlsen (2835, +9) has now approached dangerously close to Garry Kasparov’s rating record of 2851. With the idea of slight rating inflation and the onset of computers, this record is bound to fall, but it may also show how far Kasparov was ahead of his contemporaries. There have been four players to eclipse the 2800 barrier although World Champion Viswanathan Anand dropped a point off (2799, -12) with a string of relatively poor results. 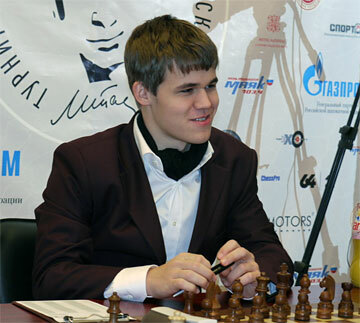 Carlsen has a 30-point bulge over his next competitor in Levon Aronian (2805, +3). Vladimir Kramnik (2801, +1) is holding steady after rejoining the club a few months back. While these ratings are not in real-time, the recent list shows a new breed taking hold. Hikaru Nakamura is on #12 (2759, +1) on the FIDE list, but #5 on the live list (2777.5, +18.5). The American unceremoniously ended his relationship with Kasparov after only a month of cooperation, but appears to be doing just fine at the ongoing Reggio Emilia. Teimour Radjabov (2773, -8) tumbled slightly after the European Team Championships while Veselin Topalov (2770, +2) played well at European Team and is at number six. Only nine points separate him and the next five players… Sergey Karjakin (2769, +6), Vassily Ivanchuk (2766, -9), Alexander Morozevich (2763, +1), Vugar Gashimov (2761, +4) and Alexander Grischuk (2761, +9). Luke McShane (2691, +20) made a nice gain at the London Chess Classic while his compatriot Michael Adams (2724, -10) and Nigel Short (2677, -21) floundered. On the women’s list, there was some movement. Hou Yifan (2605, +27) went back over 2600 after beating Humpy Koneru in the Women’s World Championship match. Thus, the two players have switched positions, but are still a great distance from the “Queen of Chess,” Judit Polgar (2710, +0). 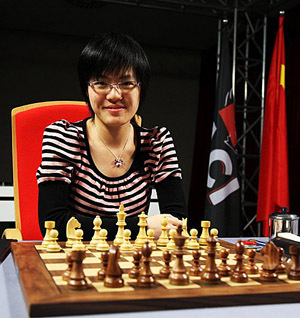 Hou Yifan and China continued to show their dominance in women’s chess by winning the Women’s Team Championship crushing Russia 4-0 on the way to gold. Russia’s Kosintseva sisters, Nadezhda (2537, -9) and Tatiana (2513, -13) have lost some steam after making it as high as #4 positions. Slovenia’s Anna Muzychuk (2580, +18) moved into the fourth position after torching the field at the European Team Championship with 8.5/9. Kateryna Lahno (2557, +8) got a strong 5/7 in the same tournament. China’s Ju Wenjun (2552, +9) and Zhao Xue (2551, +10) have climbed the list and were part of the gold medal team at the Women’s World Team. Zhao has rebounded with strong results after falling into a slump over a year ago. China now has three players in the top ten. Nana Dzagnidze (2535, +19) got a boatload of ELO from the European Team and Women’s World Team. Top-rated juniors square off at 2011 Reggio Emilio (0-1). On the Juniors list, Fabiano Caruana (2736, +9) still holds the top position with Anish Giri (2714) following. Both are playing in Reggio Emilio. 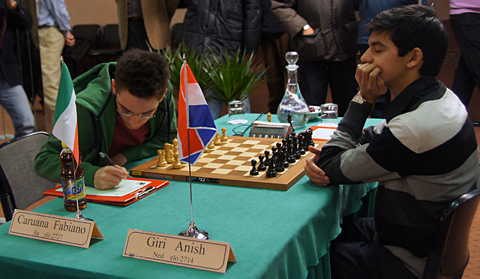 Giri won their first encounter and closed the gap a few points. Several Asian players have populated the junior list starting with Chinese champion Ding Liren (2660), Philippines’ Wesley So (2653, -6), India’s Parimarjan Negi (2641, +24), Azerbaijan’s Eltaj Safarli (2638, +8) and China’s Yu Yangyi (2631, +8). Again China has three of the top ten juniors (triple-counting Hou Yifan on women’s, juniors’, girl’s lists). However, let’s continue to watch for Indians to have more representation since they are dominating junior tournaments around the world. Finally, the girls list has Hou Yifan followed by the other Muzychuk in Mariya (2483, +23). Anastasia Bodnaruk of Russia (2419, +2) is still hovering at the top of the list while World Youth gold medalist Deysi Cori (2415, +1) is on fourth position. Georgia has hope in maintaining the women’s venerable chess history with Nazi Paikidze (2411, -11).